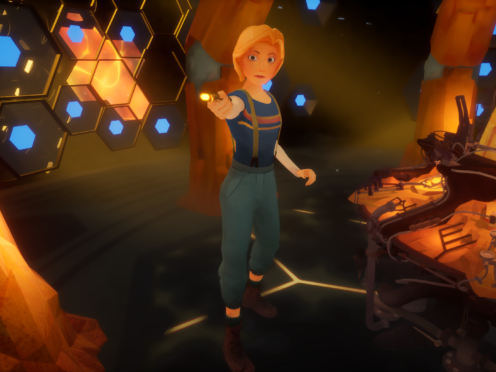 A short animated virtual reality film of Doctor Who is being produced by the BBC to allow fans of the long-running sci-fi series to experience life on the Tardis from a different perspective. Doctor Who: The Runaway is a 12-minute interactive story that will put viewers up close to the action dealing with a deadly threat, alongside the 13th Doctor, voiced by Jodie Whittaker. “Fans will experience the Tardis like never before in this thrilling new interactive story,” Jo Pearce, creative director for the BBC’s digital drama team, said. The broadcaster has worked with Passion Animation Studios to create the experience, which will be available on selected VR headsets in the coming months. Current series composer Segun Akinola has worked on new original music for the VR short, with Victoria Asare-Archer writing the script and Mathias Chelebourg directing. “Our team at the BBC VR Hub has been creating new experiences with the goal of helping to usher virtual reality into the mainstream, and Doctor Who is exactly the sort of series that can help more people to try this new technology,” Zillah Watson, head of BBC VR Hub, said. Series 11 of the main Doctor Who television programme ended in December last year, followed by a New Year’s Day special, but will not return to screens for series 12 until 2020.